1/5 School is still following conventional method of teaching. Need to embrace child centred pedagogy by not just saying but really bringing the culture change. Also STEM needs to be integrated. Suraj School, Sector 56 is a Private Co-Educational School located in the Sector 56 neighbourhood of Gurgaon. You can view the exact location or driving directions of the school on the map and school pointer on it. The school was founded in 2017 and currently offers Nursery, Kindergarden, Primary School, Middle School and High School. It proposes to be affiliated to CBSE. This school first reviewed on 21 Dec 2018 at SchoolWiser. The overall experience with Suraj School, Sector 56 based on the ratings left by users so far seems to be below par but the sample size of the ratings is insignificant. The ratings suggest that the school offers a lot in terms of the . It also scores reasonably on Academic Rigour, Safety and Hygiene & Variety. Though parents may seem to have some reservation over Teacher's Competence. Checkout detailed ratings and reviews below for reference but do exercise your best judgement. Welcome to Suraj School, Gurgaon. Suraj Group has two branches in Gurgaon, in sector 75 and sector 56. Gurgaon is the eight branch from Suraj Education group. With eight schools across Haryana (Mahendergarh, Rewari, Pataudi, Kosli, Bawal, Bhiwadi), Suraj Education Group has been able to position itself among the leading global schools in NCR by its record breaking performance in CBSE as well as COMPETITIVE EXAMS. Our schools have been appreciated for many years by parents owing to excellent education standards and strict discipline. Suraj School develops the basic skills necessary to ride on the challenging roller coaster called Life. The purpose of education at Suraj School is to train young people for responsible citizenship in an epoch that is witnessing bewildering change as unparalleled challenges. The future of any nation depends on character of its people. Suraj School seeks to send forth a steady stream of such men and women who will enrich the nation and serve the world. This is possible by imbibing in them a sense of dedication, devotion and desire to serve. The child needs to be minimum 3 Years as on 31 March 2019 to be eligible for Nursery admission. School Admission applications can be made Offline at the school and Online on the school website. Originals and copies of the following documents are typically required for processing application of admission: 8 passport size photographs, Birth Certificate, Last Year’s Report Card, Transfer Certificate, Character Certificate, Resident proof, Aadhar Card of Candidate and . New academic session for the school starts from April. You can find further details below for reference on admission eligibility and application for Nursery and Higher Grades in the section below, but we strongly recommend that you check the school website for most accurate and up-to-date information. 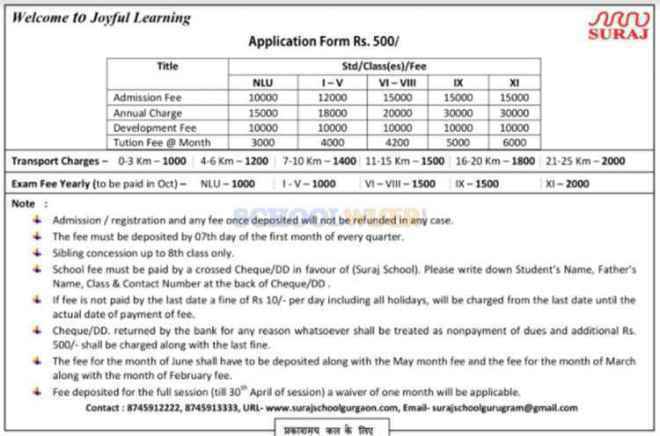 A detailed fee structure & complete breakup for Suraj School, Sector 56 is provided below for reference. The objective of the fees details below is to provide an economic reference point for parents to understand approximate expense for this school and evaluate affordability based on their current circumstances and for the long term. For parents admitting their children in admission session 2017-2018 at The school the total school fees for the first year including all admission related charges for Nursery but excluding transport fees shall be around Rs.72,000. This includes total One-Time Admission related Charges of Rs.10,000. For parents continuing in the school from previous years, the effective annual fees is around Rs.62,000 i.e. approx. Rs.5,166 per month or Rs.15,500 per quarter without transport fees.